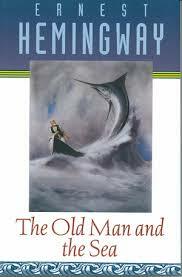 Okay, so “The Old Man and the Sea” will never be my favorite Hemingway novel – that goes to “A Farewell to Arms,” and I will always love best the short story “Cat in the Rain.” Nevertheless, “The Old Man and the Sea” was better than I remembered. This time Santiago, the old man, came to life for me and I cared about him. And he cared about people and the fish and all of life. He was pretty funny talking to himself and his fish out there in the boat. He was a curmudgeonly old fart, strong, knowledgable, courageous, but with disastrously bad luck. And I loved the boy who loved the man – I loved his tears and his faith. It is indeed great book. I remember very well we had to read it in school. I did like it.